If you're looking for something special to give the man in your life come Father's Day, consider Montblanc's Patron of Art Pens Limited Edition writing instruments. As a tribute to 20 years of Montblanc de la Cultura Arts Patronage, Montblanc presents refined and elegant writing instrument, Maecenas. Limited Edition 4810A: Limited to just 4,810 pieces, which corresponds to the height of Mont Blanc in meters, this Patron of Art Limited Edition is a fitting tribute to Maecenas, richly decorated with symbols from his life and greatly influenced by Roman aesthetics. Limited Edition 888 - In keeping with the tradition started in 1995 of an even more exclusive Patron of Art Edition, limited to just 888 pieces, this 750 solid gold fountain pen features a skeletonised cap with the first letters of Horace’s Ode, one of Maecenas’ poems by his protégé. 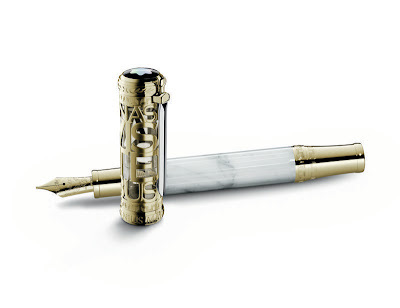 The barrel of the writing instrument is worked out in origin marble with a distinctive column effect. Montblanc is exclusively available at Rustan’s Makati and Shangri-La Plaza. 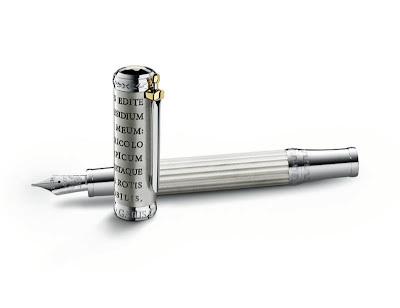 The Maecenas Edition 888 will be exclusively available at Montblanc’s upcoming boutique at the Newport Mall this June 2011.
so is harvey getting this pen on june 12? Hahaha, nope! He's not a "pen guy". He'll say, save it na lang...for a nice watch! Hahaha!